Our high-quality clothes hangers have proven themselves over decades as a practical and durable solution for the handling of textiles. They are available in stainless steel, including spring hardened, and in different wire sizes and designs in order to optimally fulfil their intended function. Plastic shoulder pads guarantee a gentle contact surface and prevent garments from bulging — popular as clothes hangers for hotels. Plastic chip holders and spacers, suitable for all standard microchips and barcodes, ensure that your conveyor system runs smoothly — clothes hangers for dry-cleaners. 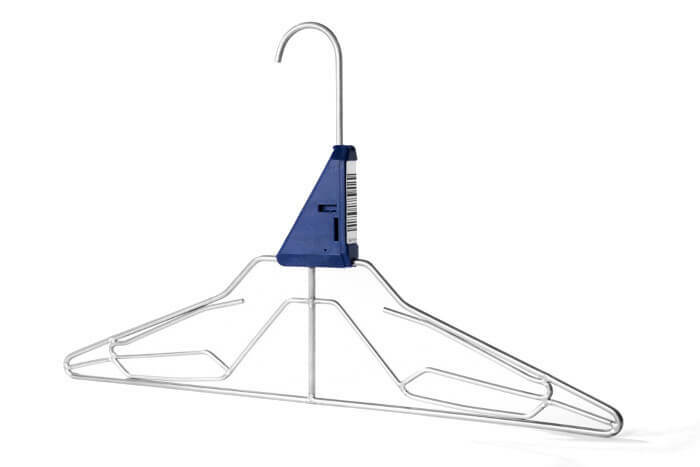 Our clothes hangers have different clamping and hanging functions and wedge blocks for you to choose from — laundry-supplies clothes hangers. Affixing an anti-slip silicone tube at various points, including as a spacer at the hook, is also possible — clothes hangers for dry cleaning. The hook lengths are variable; the hook or body can be laser-printed according to your wishes. Thermal rounding of the hook end or embossing of the hook is possible — hotel hangers. 5830-18 With chip holder "Snap-it"
Stainless steel hanger with clamping function, wedge blocker and chip holder and spacer "Snap-it"